World’s 6th Multimedia Sikh Museum authored, produced and created by world known encyclopaedist and museologist Dr Raghbir Singh Bains of Canada was inaugurated by Singh Sahib Giani Gurbachan Singh, Jathedar Sri Akal Takhat Sahib in presence of the elite gathering hailing from different parts of India and different regions of the world. The building was constructed by Baba Shinder Singh Kar Sewa Fatehgarh Sabhra (Sabhraon). After defeat of the Sikh forces at the battles of Mudki, Pheru Shahar, Aliwal and Baddowal the last and fifth Anglo-Sikh war was fought on February 10, 1846 at Sabhraon where S. Sham Singh Attari sacrificed his life alongwith other Sikh soldiers to protect Khalsa Raj established by Maharaja Ranjit Singh. The Museum has been dedicated to Shaheed S. Sham Singh Attari to commemorate his priceless martyrdom to protect humanity. Global society once again got an invaluable gift of the world’s 6th museum on Sikhism, Sikh history, mission, Sikh philosophy, culture of the followers and their heritage on the latest technology of the world. The museum is a one-stop platform for those wanting to refresh their knowledge about Sikhism and re-learn its forgotten facts. After the first Multimedia Sikh Museum set up at Khadur Sahib by Dr Bains, the second museum was set up in Jalandhar, 3rd in Mississauga, Ontario, Canada, 4th museum in Gwalior, Madhya Pradesh and fifth museum was set up by Dr Bains at Sultanpur Sahib. These museums are attracting a lot of international visitors ever since these were inaugurated. Thus the hard work and honest commitment of Dr Bains made his community proud in the world. The idea for this museum was floated during 2014 and the work of setting up the museum at Sabhraon (District Ferozepur) was finished in 2015. The driving force behind the museum is Canada-based Sikh scholar Dr Raghbir Singh Bains who has to his credit thousands of pages of text, tones of graphics, audio, video, animations and paintings on Sikhism authored and compiled over a period of 25 years. The 6th museum is again a Bains' way of giving back to the community in India, where he spent a major part of his life. Equipped with three made-to-order 17 inches touch-screens and 3 LCD TVs, the swish museum has 13 paintings depicting different incidents from the Sikh history. The captions about these pictures can be read and listened by touching audio buttons meant for Punjabi, English and Hindi languages. The computerized setup in the museum has a material of more than 400 hours which includes thousands of subjects on Sikhism, Sri Guru Granth Sahib in Gurmukhi and English, Kirtan in 31 Ragas, information on socio-spiritual life history of Sikh Gurus, specially designed educational lessons on learning of English and Punjabi, Gurdwaras of the world, Sikh encyclopaedia for adults and children both, thousands of questions and answers on Sikhism and other religions, quizzes, big chapter on curbing the menace of drugs, foeticide HIV-AIDS and other social evils, animated Sikh Ardas and series on Sikh martyrs, religious videos, and much more. Bains says his project has many objectives to educate the youth about Sikhism, its golden principals to spread message of peace and prosperity, universal brotherhood, well being of entire human race and to help humans to lead a generous and truthful life to serve humanity in a better way. Singh Sahib Giani Gurbachan Singh Jathedar Sri Akal Takht Sahib thanked Dr Raghbir Singh Bains for creating this valuable facility with newest technology. He appealed people to visit the Museum and stay away from social evils for building a better society in the world. 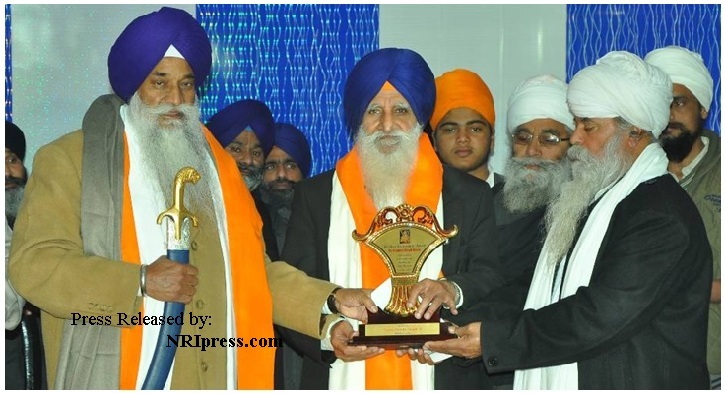 Baba Shinder Singh thanked the gathering and urged people to fight against social evils. While addressing the gathering, Dr Raghbir Singh Bains said, “Please accept this gift of new museum. I have tried to pay back to the community. Bless me to continue my honest efforts with humility. The next time you're in Sabhraon or in its vicinity, do stop by at this treasure trove. The best part of the museum is absolutely free entry. Being writer, creator and setter of the record holding six Multimedia Sikh Museums in the world, Dr Raghbir Singh Bains was awarded “Lifetime Achievement Award-2015” for putting in major part of his life in authoring and creating the colossal projects in the world.